August is National Family Fun Month, which means it’s a great opportunity to seize the remainder of summer by spending time with family. 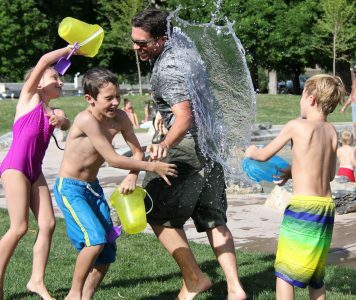 Here are some cool activities to help you and your family finish out the summer! Take a family bike ride. Make sure everyone is wearing properly fitted helmets and all bikes are in good riding condition. Following our A B C Bicycle Safety Checklist is a great way to make sure your bikes are ready to ride. Going on a last minute family beach trip is not only exciting, but it is the perfect way to spend a hot summer day. Bring plenty of water to stay hydrated and make sure you apply sunscreen to keep your skin protected from the suns UV rays. Lace up your sneakers and take a walk with the family. Walking in the park, on the beach, or around your neighborhood is a great way to stay active together. Remember that cars do not always see pedestrians walking, so make sure you look both ways before crossing the street and always be aware of your surroundings. After a long day at work, the thought of going out can be exhausting. To avoid this, consider having a family movie night. Pick out your favorite family movie, get the popcorn ready, and enjoy the night together. The month of August doesn’t have to mean back to school shopping and the thought of summer ending. Instead, spending time with your family is a great way to make the most of summer’s last days. It doesn’t matter what you do, as long as you are safe and are having fun with your family!